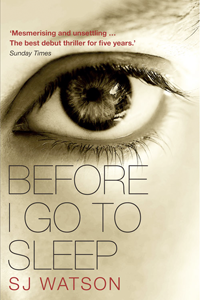 When I initially heard about Before I Go to Sleep I assumed it to be the adult version of YA novel Forgotten (read my review here), but it turned out to be surprisingly different. Instead of focusing on the here and now and how the main protagonist copes on a daily basis without her memories, it actually focuses on the past and unraveling the truth to how she lost her memories. Christine doesn't cope well with the loss, each day is a repetition of the one before it with very little progress along the way. Until she meets Dr. Nash. He suggests she keeps a journal to record her most important memories throughout the day so a quick read the next morning will bring her swiftly up-to-date. As soon as the reader gets to the diary part of the novel the story becomes increasingly gripping and interesting with a new revelation on almost every page. The ending however was very predictable (I knew what was truly going on almost from the start of the novel), which is why I am giving Before I Go to Sleep 4.5 stars instead of the 5 stars a book that grips me as much as this one did would normally receive.